Benefit from this tutorial to the fullest by learning why alerts from MacSaver101.com aren’t trustworthy and how this popup virus can be removed from Mac. The to-do list of a Mac user who confronts MacSaver101 virus should definitely be revamped otherwise their web browsing will henceforth become an unbearably tiresome experience. The source of the problem in these circumstances is a piece of disgusting adware that changes certain components of Safari, Chrome and Firefox operational mode. Those modifications are implemented in the background so that the admin is unlikely to notice and prevent them. 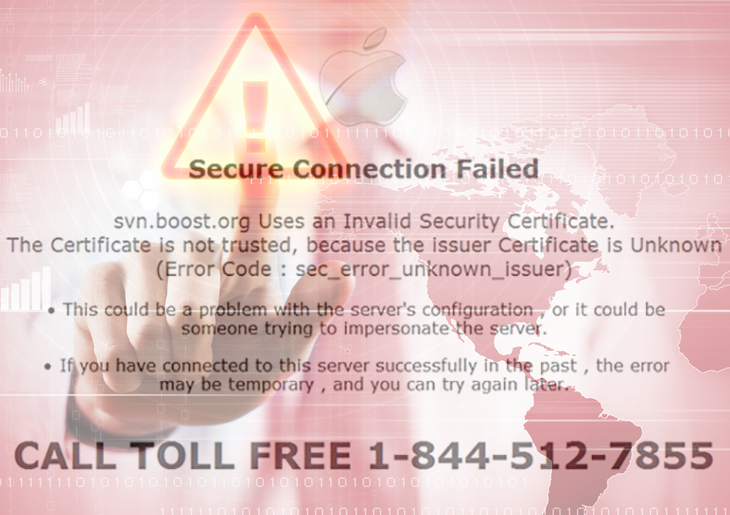 At the end of the day, the regular web surfing gets constantly interrupted by popups from MacSaver101.com, which is a malicious landing page equipped with fraudulent functionality and titled “Malware detected”. What the victim gets to see at the start of such an encounter is a misleading message that says “Secure Connection Failed”. The alert goes on to report an invalid security certificate, with an alleged error code also provided in it. Now, the gist of this entire attack is the recommendation to call a toll free phone number 1-844-512-7855 in order to resolve the problem. Obviously, the user will go through some manipulative social engineering if that number is called, with the troubleshooting assistance having a furtive, yet undoubted, financial implication. There is also a popup accompanying every such instance, which reads “Critical Security Warning, your system is infected with a malicious adware attack”. By the way, the villains have probably misspelled it, writing “adward” in there instead. Once again, the popup alert suggests reaching the “customer service” via the indicated number. Those guys claim to perform “additional security checks to verify the source of the attack”. Nice try, but not too convincing. The script that triggers and powers this popup activity is isolated to the individual Mac machine rather than be caused by some odd certificate bugs that are wrongfully reported. It’s actually an adware program compromising the browsers running in the system. The most likely way that this hazard has made it into the box is through one of the recent program installations that the user sanctioned. Some free apps are getting caught red-handed all the time, providing distribution assistance to controversial objects masqueraded as something useful. MacSaver101 hoax mainly sticks to a pattern like that. The necessity to get rid of this popup malware on affected Mac is not something to even debate about, so do not fail to spend a few minutes reading the part below, which is a walkthrough tailored for effective adware removal. When confronted with malicious code like the MacSaver101 on Mac, you can neutralize its toxic impact by leveraging a specially crafted system utility. The Freshmac application (read review) is a perfect match for this purpose as it delivers essential security features along with must-have modules for Mac optimization. This tool cleans unneeded applications and persistent malware in one click. It also protects your privacy by eliminating tracking cookies, frees up disk space, and manages startup apps to decrease boot time. On top of that, it boasts 24/7 tech support. The following steps will walk you through automatic removal of the MacSaver101.com infection. 4. Check whether the MacSaver101 virus has been fixed. If the lock screen is still there, go to the Uninstaller option on Freshmac GUI. Locate an entry that appears suspicious, select it and click Fix Safely button to force-uninstall the unwanted application. 5. Go to Temp and Startup Apps panes on the interface and have all redundant or suspicious items eliminated as well. The MacSaver101.com fraud shouldn’t be causing any further trouble.